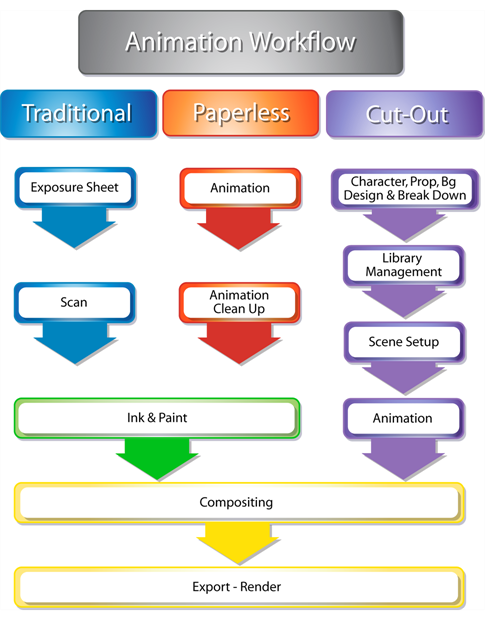 Now that you know the differences between the traditional, paperless and cut-out animation types, you can move on to the basic organization of their workflow. The following illustrations show the animation pipelines that represent the most popular workflows. The tasks can be divided or the order can be rearranged to suit the specific needs of the studio or user. After familiarizing yourself with the basic workflow pipelines, you should read about the various examples of the workflows and how the individual and the studio are organized according to their size.